Over the last two decades, BON JOVI has earned the respect of the music industry and the loyalty of legions of fans around the globe. They have sold over 100 Million albums worldwide and, since forming in 1984, BON JOVI has performed more than 2500 concerts in 50 countries before more than 32 million people. The first question that might occur to you when you hear the propulsive blast of power chords, drum beats and sneering vocals that opens the title track of the new Bon Jovi album is, "This song is called 'Have a Nice Day'?" It sounds awfully raw for such a smiley-face title. That discordant effect, of course, is intentional. "That title was the first and, ultimately, the last one I'd come to," Jon Bon Jovi says. "There's obviously a sense of irony when you say it. You can say it one way and you can take it another way." The song sets the tone for the entire album - twelve songs about rising above adversity and staking your claim to a fair share of what the world has to offer. In other words, twelve songs centered on a theme that, in the course of a stellar career, Bon Jovi has made its own. "Have a Nice Day" itself is a defiant response to the disappointment the singer felt after the 2004 presidential election. He had campaigned for Democratic nominee John Kerry. But in true Bon Jovi fashion, the song rises into a chorus that counsels renewed conviction in the face of setbacks, optimism against opposition, standing your moral ground regardless of the consequences: "I ain't gonna do what I don't want to/I'm gonna live my life...When the world gets in my face, I say/Have a nice day!" For guitarist Richie Sambora, the rough-edged sound of tracks like "Have a Nice Day," "Last Man Standing" and "I Am" is a celebration of another recent societal development: The resurgence of full-on rock & roll. "This album continues the evolution of Bon Jovi, obviously," he says, "but I had it in my head to make a big-sounding rock & roll record. I wanted to capture the essence of this band, almost like in a live setting, because that's our forte. That's where I was trying to put it. I wanted to be aggressive, really. I felt that was available to us now." To help achieve the band's goals in the studio, Bon Jovi called in producer John Shanks, who won a Grammy for "Producer of the Year" in 2004. "He deserves that award, he's brilliant," Bon Jovi says. "We co-wrote songs together and we recorded them on the spot with a drum machine - him and Richie wailing on guitars, no drummer, no bass player, and I would sing the vocal. I'd never made a record like that before. What an experience - nothing was sacred!" 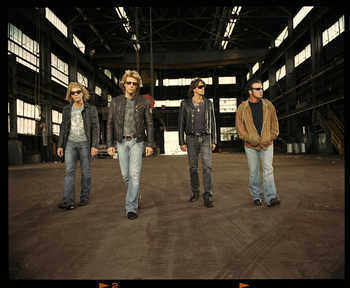 Keyboardist David Bryan and drummer Tico Torres, along with bassist Hugh McDonald, eventually recorded their parts, and in a matter of months, Bon Jovi regarded the album as done. But then he changed his mind. The songwriting had come so easily that, just as he was about to turn the album in to his label at the end of last year, the singer began to worry that maybe it came too quick. "I felt like I was cheating," he recalls. "There were four songs that felt 'crafted' - and shame on me if at this point in my career I ever craft a song." Consequently, he wrote four new songs from the gut - "Novocaine," "Last Cigarette," "Story of My Life" and "Wildflower" - and tweaked the lyrics on some of the others. "Bells of Freedom," for example, started out as a "he/she kind of a thing," Bon Jovi says. "I hated it. I knew there was something more in that chorus." The song now echoes Bob Dylan's "Chimes of Freedom" in its title and insists that "the sun still shines on one who believes." It is now exactly what he wanted it to be. "I hope that people are going to like that song," he says. "It's not meant to be a pop hit single, it's not meant to be a video. It's meant to be something that, when I play it live, the sweat is going to be legit." Dylan, as it turns out, was also the inspiration for the hero of the blistering anthem, "Last Man Standing" -- a carnival attraction who represents the last link to a vision of rock & roll meant not merely to entertain people, but to change their lives. 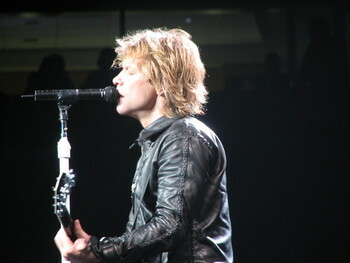 "Here's the last man standing/Come see, hear, feel the real thing," Bon Jovi sings. "When Johnny Cash died, I picked up my guitar and got the idea that Bob Dylan was the last man standing, the last of the real gods," Bon Jovi says. "It was for Dylan, Cash, Lennon, Elvis - that's what I was thinking." Have a Nice Day, then, is a classic Bon Jovi album - an immediately satisfying collection of songs by a band that has weathered more than two decades of trends and lived to tell the tale - and thrive. "We've always stayed true to who we were, and didn't jump on anyone else's bandwagon," he says. "It wasn't a conscious attempt to do anything, except to avoid whatever doesn't ring true and chasing anyone else's idea of success." Richie Sambora agrees, "When Jon and I sit down to write, it inevitably sounds like us," he says. "You can't get away from that. All we had to do is be ourselves -- and step on the gas pedal as far as the sound was concerned." JBJ sings "Someday I'll Be Saturday Night."